i keep this picture with me for obvious reasons. like we should go around doing that. One of the best! I want to be as happy that dog in the last frame. I'm think I'm gonna try that jump, tongue hanging out, and all. I have this saved in the pictures on my phone so I can randomly send it to friends when they're having a bad day. Works every time. Hahahahahahaha!!! This is hilarious!!!! 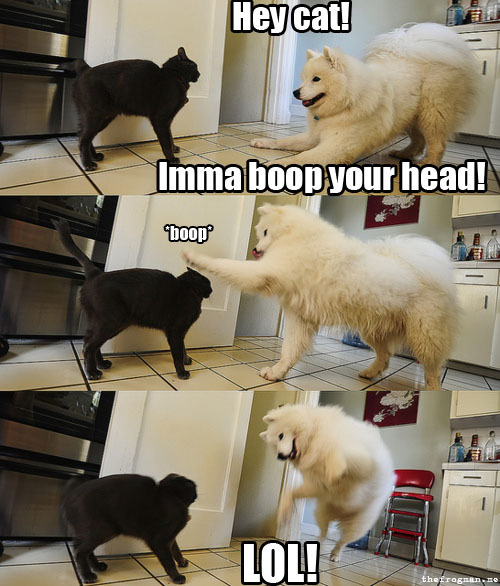 Even more so as it is exactly what my dog and cat look like and literally just as silly and goofy as they are!!! hahahahaha thanks for sharing! i tried that at work and it didn't fly. losers. you must work with terrorists or something because how could this not fly? STOP POSTING HILARIOUS THINGS THAT MAKE ME GIGGLE OUT LOUD WHEN I AM SUPPOSED TO BE BEING PRODUCTIVE AND WORKING AND STUFF. STOP IT.